It has been a little bit since my last article and, while I won’t be writing every week moving forward, Coolstuff has left me an invitation to still post when I have something especially awesome to share! The thing that has most impressed me about this deck is its ability to keep up against aggressive decks while also having the capability to out grind the current King of midrange, Sultai. Let’s dive into talking about the card choices here and talk about how this is possible. One of the things that makes this such a good Hero of Precinct One deck is that while it doesn’t need Hero in play to be functional, it goes into overdrive when it does keep a Hero around. Our main deck has 23 multicolored spells that allow Hero to generate value while we play them. One of the reasons why this deck is cohesive when it doesn’t draw Hero is because we have a variety of other cards that generate tokens. 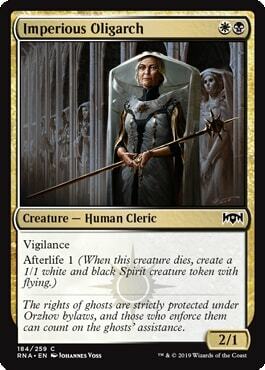 Afterlife creatures like Oligarch and Tithe Taker not only provide extra ways of making tokens, but also provide additional proactive 2-drops that can apply early pressure. 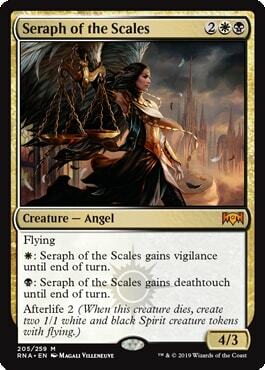 Seraph of the Scales might be one of the best 4-drops out of the most recent set. There are a lot of matches in this format that involve the ground getting gummed up, so having a flying threat to literally go over the top is potent. Unlike many expensive flying creatures in this format, Seraph isn’t soft to opposing Vivien Reids, because if they play Vivien and shoot our Seraph, the two flying tokens left behind clean up the Vivien while generating further value. 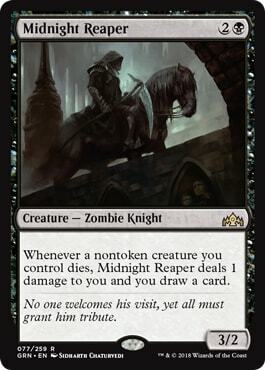 Midnight Reaper is one of the reasons our deck is so reasonable against Sultai and other midrange decks. 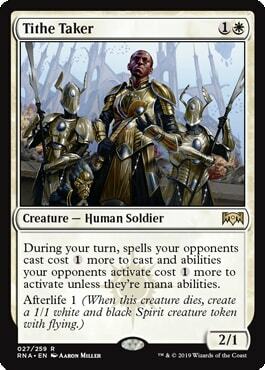 It allows our two mana afterlife creatures to turn into a new card once they inevitably get outclassed in the mid game. 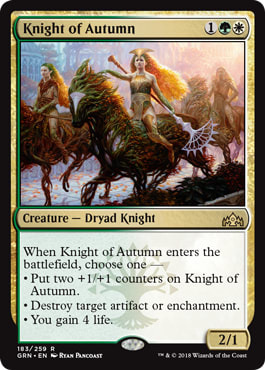 Knight of Autumn is just a flexible multicolored card. While it is rarely a perfect 10, it is almost never bad. Providing a 4/3 when we need more pressure, four life against aggro, or taking a Wilderness Reclamation off the table - there is strength in flexibility. 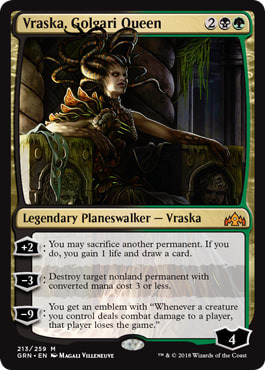 Vraska, Golgari Queen is a card that feels very powerful in this format, that up till now has lacked a good home. In many decks, her +2 is hard to leverage every turn as a source of card advantage; however in a deck that has lots of tokens, this is no longer true. Between our Heroes, Afterlife creatures, and occasionally extra lands, we almost always have something to feed to our Queen. Vraska’s -3 is flexible removal that is especially good in a format where people are playing Hydroid Krasis as their payoff (Krasis has a converted mana cost of two on the battlefield). Because this deck goes wide, it is also great at leveraging Vraska’s ultimate as a game ending play. 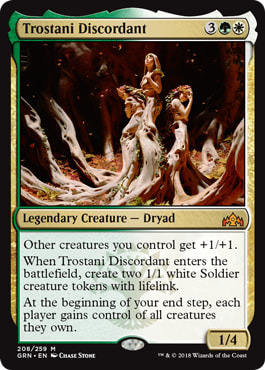 Trostani Discordant is a card that is not only great as a payoff for tokens, but also helps against both aggro and Sultai alike. Against aggro, Trostani generates three blockers - two of which have life link to buffer our life total back up. Against Sultai, Trostani makes their copies of Hostage Taker and Thief of Sanity much worse by returning our stolen cards back to us at the end of our turn. 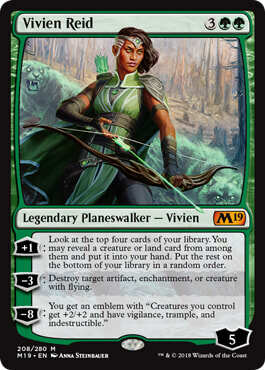 Vivien Reid is just a good card that is a format staple for a reason. There are a lot of flying threats we want her to shoot down in addition to annoying artifacts and enchantments. 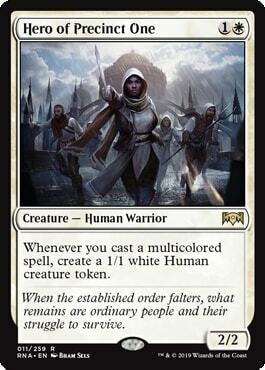 In the event there is nothing for Vivien to hunt in play, she generates a constant stream of card advantage in our deck full of creatures. 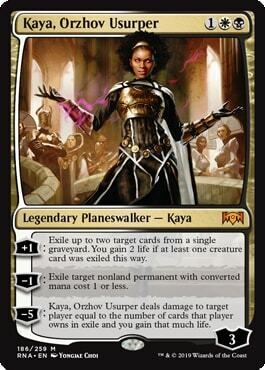 Kaya, Orzhov Usurper has really grown on me as this format has matured. Against the aggressive decks in the format, she has plenty of things to exile. Against control and combo decks, she prevents Search for Azcanta from flipping, while also making cards like Chemister's Insight awkward. She is weakest against other midrange decks, but does still manage to make cards like Find // Finality much worse. Finally, Assassin's Trophy and Mortify are the glue that holds our deck together against the variety of threats in this format. 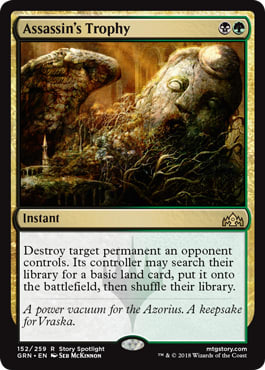 While Trophy has the downside of giving our opponent a land, being able to kill everything from a creature to an Azcanta, the Sunken Ruin is really powerful. The fact that Trophy gives us a token with Hero as well means that it often has some upside to balance out the downside of giving them a land. Mortify is slightly less flexible than Trophy, but also does not come with any downside. With key enchantments like Wilderness Reclamation, Search for Azcanta, and Experimental Frenzy being prominent in the format, Mortify is a premium removal spell. If you are someone like me who enjoys midrange decks, but haven’t really enjoyed the game play of Sultai in this format, then I would highly encourage you to give this Abzan Hero list a try. It has occasionally aggressive draws that give you game against combo and control, while also having the tools to allow you to be successful against the more aggressive decks in the format.